I finally cut down the last of my baptisia pods, which were attractive in the fall, but had become bent over and forlorn since the last snow. Still, I liked the shape of this stem and decided that a stark portrait might be fitting for the first day of winter. Christina Rosetti penned In the Bleak Midwinter as a Christmas poem in England sometime prior to 1872. The entire poem was later set to music and published as a Christmas carol in 1906. The script is based on Italics from the Treatise on Hawking by Italian scholar Francesco Moro, penned in about 1560-1570. Note: I’ve finally updated my blog header and added a few new sketches to the journal section. Check them out when you have a chance and let me know what you think. This entry was posted in Garden, Journal, Watercolor and tagged garden, garden & flowers, nature, solstice, watercolor, winter by Jean Mackay / Drawn In. Bookmark the permalink. Hey Jean — fabulous study in browns, and perfect for this time of year. And I love your new header! Thanks Beth! Mostly just used burnt umber and ultramarine blue (a great combination), underpainted with a mix of yellow ochre and a bit of rose. Happy Holidays to you! 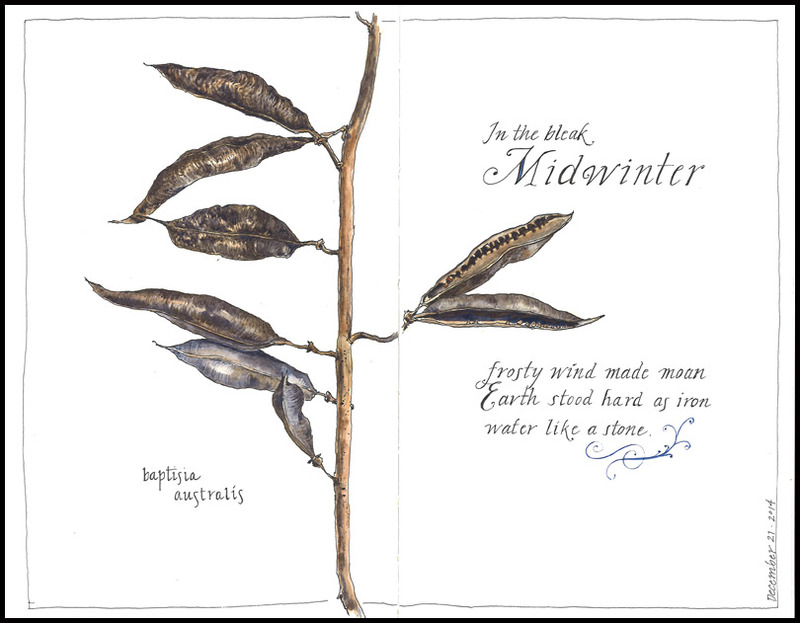 Jean, thanks for getting us into the winter mood with a very lovely portrait of this plant. The script is also nice! My favorite Christmas carol. You have given your heart to all of us. Thank you.